Ran across this in today’s Washington Post online: “Bloody Ritual, Modern Meaning.” Check it out; it’s a short take on the passion of Imam Husain (a grandson of Prophet Muhammad) as observed and commemorated during the week of the tenth of Muharram. The Ashura festival, as it is also called, combines extensive liturgies and dramatic passion plays re-enacting Husain’s martyrdom at Karbala (in Iraq) at the hands of Umayyad caliphs from Damascus in 680 AD/CE, or in Islamic reckoning, 61 AH. The WashPost piece focuses on its ritual observance in Kabul. 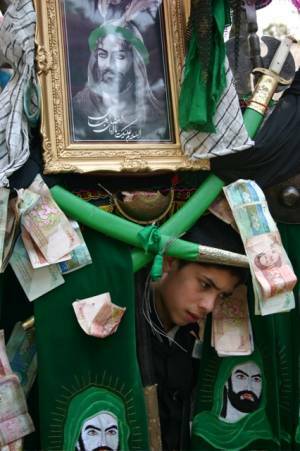 Like most universal rites of commemoration, the Ashura practices vary from location to location, but there are always passion plays of the event, and there are always ritual displays of mourning for Husain, and it is this that studies and documentaries tend to highlight, condemn, and criticize as being offensive to modern sensibilities. The mourning rites involve symbolic mortification of the body, and the methods involve everything from rhythmic beating of the chest to serious flagellation using knives whipped over the back. Religion scholars have long noted the similarities of these types of practices to medieval Christian ritual processions of penance. But such comparisons miss the point of Ashura. It is true that there are some similarities between the martyrdom of Jesus and the martyrdom of Husain, and both have come to have cosmic significance in Christian and Muslim (especially Shi’a Muslim) ethos and worldview. Both stories likewise served as identity markers and the memory of them are celebrated as foundational for the community memory. Still, the point is not the blood-letting in itself, but rather to protest an unjust death brought about by the injustice of spreading tyranny. In the class I’m teaching on Holidays, one of the points we’re discussing now is the inherent and latent power of holidays to function in the service of the status quo AND to protest and challenge it. And in fact, when we dig deep enough to the narratives underlying many of our holidays, the story is, more often than not, a story that challenges power, and that in succeeding generations, that story is smothered over with re-interpretations to maintain the social order and try to minimize the potential that holidays have to upset the status quo of those in power. In other words, holidays and ritual celebrations in holidays are extremely dangerous, and the more visible the expression of this the ritual is, the greater the potential for the latent and suppressed power to challenge tyranny, empire, exploitation, consumption, and so on, is feared. It is for this reason that many holidays throughout history have been outlawed by governments or at least severely restricted and monitored (e.g., the Passover in the first century). The WashPost article highlights this by electing to point out the Ashura observance in Kabul, which is one of the most bloody and violent locations for the annual commemoration of the 10th of Muharram. The effect is to stir up fear, and judging from the comments on the site by other readers, it seems to work. Unfortunately. Because Ashura and Muharram have a lot to teach those of us outside of Islam. Our Muslim brothers and sisters here provide us with an example analoguous to the passion of Jesus as a righteous act that symbolizes the rejection of the abuse of power and empire in a way that our (meaning, my own tradition of Christian) lame passion plays have totally lost. Understand, I don’t advocate self-flagellation with sharp instruments, as in Muslim practices of matam or medieval flagellant movements, any more than I advocate self-crucifixion as an acceptable imitation of Christ. Instead, I advocate recognizing the ability of our religious observance of holidays to challenge the abuses of imperialism, and I can think of no better public example of this than the rites of Ashura on the 10th of Muharram. It is a demonstration of a passion for justice. Prophetic justice. Been reflecting on some old themes lately, in particular the church/consumer/community issues that have occupied a number of posts on this blog. Basically, it feels like I am “between churches,” when in reality I am in no such position. I’m a member of one place, where I attend during the academic year and where my wife is an Elder, and during the summers I go to the place we’ve gone since 2001 and where we were members before moving away. Without a doubt, these two churches are my immediate church families. The two of them are so very different from each other, as two sets of parents may be very different from each other between spouses in a marriage. One is considerably to the left of the other; one is a deeply traditional evangelical church right out of the 1950’s. There are people that I love and dearly cherish in both. I feel the pull, indeed the temptation, to engage in that favorite American pasttime for lifelong (Protestant) church-goers, which is the temptation to visit another section of the religious superstore that is America and shop for something else. And the thing is that I know which section of the superstore I’d visit, kind of like I know what kind of computer I’d buy right now if I could afford to get one at all. The problem is that I feel much more part of a particular religious tradition that I’m not even a member of than the ones I am officially involved with. As someone who views religions as communities of memory, to use Robert Bellah’s phrase, this perplexes me, especially because the very “community” I feel so drawn to is not one where I have a storehouse of individual memories. Most of my individual memories in religious communities vis-a-vis my religious upbringing are in evangelicalism and fundamentalism. Yet I no longer feel at home in these “isms,” for a variety of reasons, and with my present left-leaning mainline church I have no mnemonic links whatsoever. I’m not part of the community where most of my community memory lies, and I’m not part of the community where I am a member of because I share nothing with the communal memory of the place, although I do sympathize with much there from a purely intellectual standpoint, which is not (and has never been, at least for me) an adequate reason for becoming involved in a community of faith of any sort. In the one tradition, my mnemonic roots run deep, but the tree is dead, where in the other, the tree struggles to survive because the roots, though green, are only penetrating through cracks in the concrete, if they penetrate at all. I think that one reason so many of us feel unsatisfied by our particular church communities is because our experience with the community memory is incomplete. It is incomplete because the memory is either not perpetuated, or it is not understood, or is incomplete (as in missing important parts). Many of us, likewise, feel like we are unconnected to community memory in our faith traditions because we have other social and interpersonal relationships with people outside those particular communities that nurture “alternative” memory that, for whatever reason, are more compelling than those maintained by our faith traditions. I suspect it is a combination of all of these, with some aspects being more dominant than others in life. We have a tendency to think of “memory” only insofar as it helps us with something. We can probably blame Freud for this more narrow view, who saw memory as an aid for therapy of the individual and frequently as the source of individual and collective neuroses. 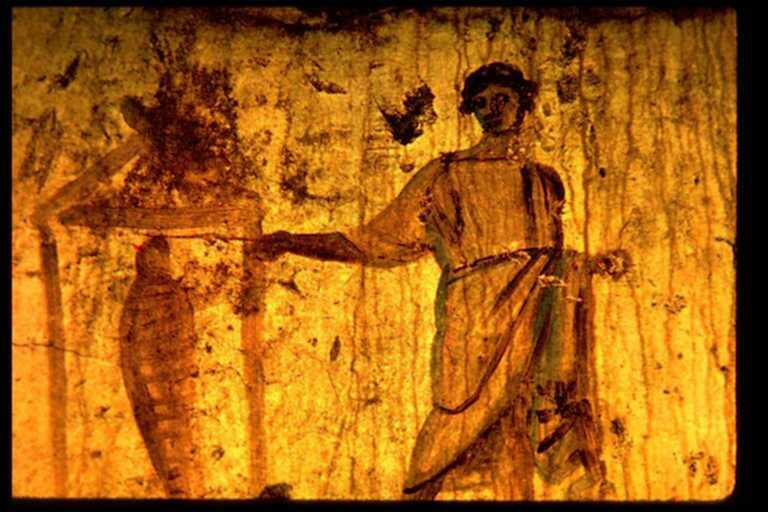 When we think of memory only in this “therapeutic” way, we neglect other important aspects of community memory; we ignore various stories, rites, liturgies and litanies, language, and physical and sensory experiences. People who value sensory, physical, and bodily representation and expression of our participation in a community are not likely to be much impressed with worship in many Protestant denominations, such as most Baptist traditions (my own), that place little or no spiritual value in elements of worship that aid in re/presenting community memory in these ways. Similarly, for “think-tank” denominations, such as presbyterian and numerous fundamentalist traditions who perpetuate a more logical and systematic presentation of the community memory, liturgy that involves anything more than a book and the mind is usually going to be regarded as so much excess baggage that is little more than a distraction from the real work of the mind and the spirit. I dunno. Mostly just “thinking out loud” here. I’m very much a sensualist who places a tremendous amount of value in the role that the body and the senses play in being a full participant in individual and community memory. I value the stories, both the positive and the negative, of community memory. I value the work of the mind to be analytical and critical even while an engaged and full participant in community work. I also value the companionship of like-minded individuals, of whom I have met many, but (alas!) few in my own geographic area. Are our communities of faith able to incorporate a more “total” or “wholistic” approach to representing and expressing their memory so as to permit membership that doesn’t, at the same time, leave an empty component in our experience in that memory?